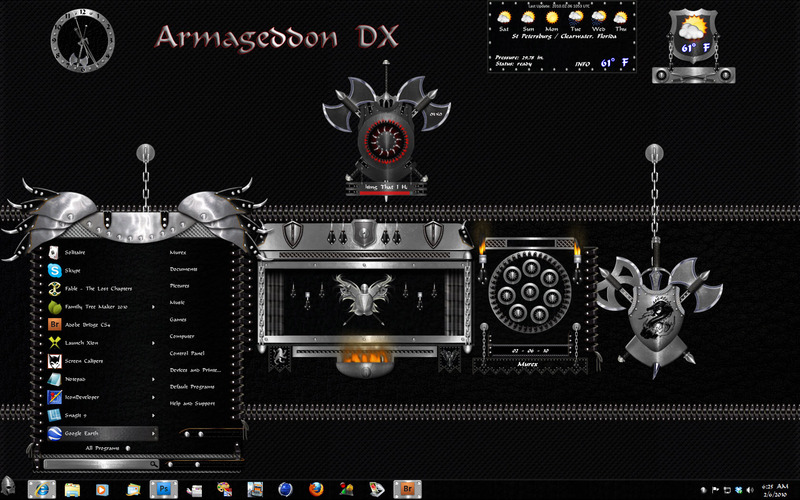 This theme was made with DX V. 4 in Windows 7. Will run on most resolutions. Includes Weather, Clock, Calendar along with sliding menus popup calendar and animated flames. Not included, any meters as the plugin meters don't seem to work for me. If I find a script or Dx includes working meters I will make them. All leather straps, spikes, buckles and leather loops were created by Xiandi. I would like to thank Xiandi for the privilege of working with her on the creation of this DXtheme . My idea was to create a theme that would blend in with her blind. I think I have managed to do so. I hope every one enjoys Armageddon DX. And thank you for downloading it. Thank you Cyndie it was fun and enjoyable working with you. All scripts were either made by sVis or Martin. Thank you both. A special thanks to sViz for help with the recycle bin. Thanks go to Xiandi and RedNeckDude for helping test my theme. Thanks Jim for helping me get the weather right. I am simply blown away by this and all the parts of this theme! Frakking awesome......5 bloody stars from me! End of. This is pure awesome sauce! This is pure awesome sauce! Thank You Tim Means a lot to me Thank You Eve.. "Pure Awesome sauce".. Never had a comment like that on a theme before... Or were you talking about what you just had to drink � � Thank you Cyndie Enjoyed working with you to. Just let me know when you want to do another one. Spectacular graphics, Merle. It's no wonder that Cyndie broke down and wanted to use them. IMO this is top quality work. Creative, clean and classy beyond words. A real keeper. How'd you slip this in? please help. how can i configure this to my window as skin.. I've already downloaded it but i don't know what to do next.. thanks!. euh theme its ok for windos xp??? how installer the theme on my computer please???? ca signifie: Ceci est un theme pour DesktopX qui nécéssite que DesktopX soit installé pour fonctionner.